Hello everyone. My name is Emma, and in today's lesson we are going to look at ways to give your opinion. So this video is very useful for anyone who will be writing the IELTS exam, the TOEFL exam, as well as anyone who wants to become a better speaker or a better writer. Okay, so in this video we will first look at some common expressions we use to give our opinion, and we will look at ways to strengthen these expressions to make them stronger and to show that we feel very strongly or not so strong about something. Okay, so let's begin. I have here the most common way to give your opinion: "I think..." So why do I have an "x" here? Well the problem is students overuse "I think..." "I think this, I think that, I think this, I think that." It gets very boring. And so if you're doing the TOEFL or the IELTS, the problem with using "I think..." is you're going to get a lower mark because that's considered basic English usage. So in order to get a higher mark or if you're just interested in becoming a better speaker or writer, I've listed some expressions that will really help aid you in expressing your opinion. So let's look at some other expressions you can use. And these all pretty much mean "I think..."
So the first expression: "As far as I'm concerned," okay? "As far as I'm concerned,...". Okay, one question you often get on IELTS, on TOEFL is: "Should boys and girls go to the same school or should they go to different schools?" What I could say or I could write: "As far as I'm concerned, boys and girls should go to separate schools." Okay? One thing that's important to note: there's a comma. "As far as I'm concerned," and then you write your opinion. Okay? Our next expression: "In my opinion,..." This is better than "I think" -- it's still a bit overused though. So I would recommend using some of these other expressions. But "In my opinion,..." is still okay to use, just don't use it too often. "In my opinion, in my opinion," -- I guess if we use the same example as before --, "boys and girls should go to separate schools." Okay? Our next expression, again, it means the same thing as "I think...", it's just a nicer way to say it. I've given you two options. You can say: "It seems to me that..." or "It appears to me that..." These are excellent to use in writing. 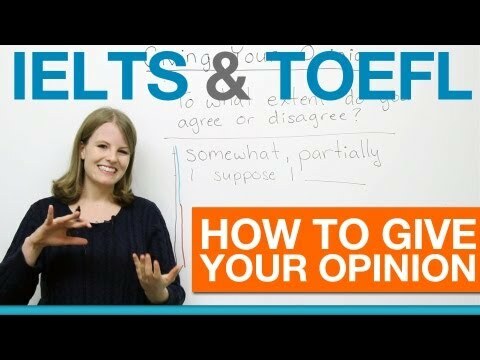 So if you're doing the TOEFL essay where you give your opinion on something, agree or disagree essay, or the IELTS essay this is a good one to use. One question that's often asked in the TOEFL and I think also the IELTS: "Do parents make the best teachers? Do you agree or disagree?" So I could say: "It seems to me that parents do make the best teachers. ", "It seems to me that parents do not make the best teachers." Notice one other thing about this expression, whereas we have a comma here and here, "It seems to me that..." there's no comma. Okay? So any time we have "that", you don't have to worry about a comma. Okay, our next expression: "I would argue that..." So again, we have "that", no comma. "I would argue that the death penalty is not a good form of punishment." Often times, the TOEFL may ask you if you agree or disagree with the death penalty. You could use: "I would argue that the death penalty is the best way to deal with criminals." So it all depends on your opinion, but you can either agree or disagree with this statement. this is a good one to use. The last one is a very high formal way of saying your opinion. "I am inclined to believe that..." So you wouldn't use this with your friends. If you have an argument with your friends, maybe you're talking about the best place to live in the world or the best place to travel to, if you said: "I'm inclined to believe that France is a great place to visit." Your friends would find your language too formal. But you can use this in writing, in formal writing. If you're writing the TOEFL or the IELTS, you can use this expression. And again, at the end we have "that", we don't have a comma. Okay?